Benton Hall Academy is a non-profit organization and a school which provides education opportunities to students with all sorts of learning styles, and helps students have a bright and productive future. 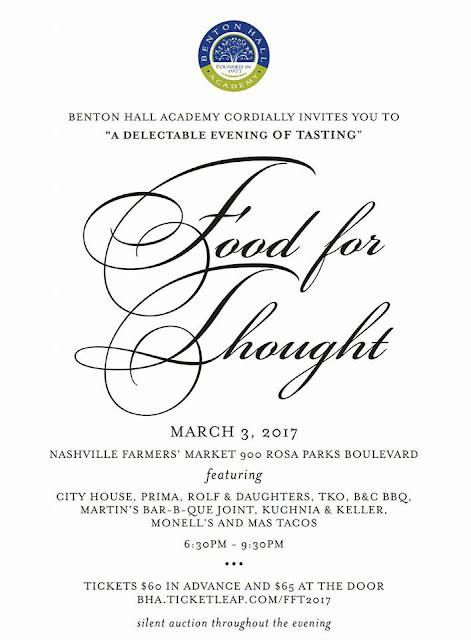 This delicious fund raiser will help Benton Hall Academy provide a quality education to a wide range of students, and help Benton Hall Academy get a permanent home. I hope you come and join me for this event. Some of my favorite restaurants are participating to help this delightful school, the students, and the staff. City House, TKO, Martins, Mas Taco, Jeni's Margot, Monell's and Smoke Et Al are a few of my favorites. I am look forward to all the delicious offerings from these excellent restaurants. Also, there is a really great silent auction. Special signed guitars, wine, great getaways, gifts, restaurant gift certificates, sporting event tickets, and more have been donated for the silent auction. Believe me, there is something special for everyone. Last time, I got the perfect English Tea Set which I enjoy most everyday. I can't wait to see the full list of goodies. Click on the flyer above, and get your tickets today. Better yet, get a ticket for a table of 4 or 8, and bring your favorite 3 to 7 friends with you.